Some 75% of modern office stock in Prague is located within a 10-minute walk from a metro station, making the underground network a crucial feature of successful office projects in the Czech capital, according to Prague Office Metro Map, the latest research from global property advisers Colliers International. Given the expanding Prague Metro is one of the key elements of the city’s extensive integrated public transportation network, Colliers decided to map some key office data by looking at stock, office rents and vacancy within walking distance from the metro stations. The report shows that 55% of modern office stock is located within a 5-minute walk from a station, a further 20% is located in a 10-minute radius, a further 13% is located within a 10 to 15-minute radius, and another 12% is located beyond that. This trend of locating modern office developments around these key transportation nodes is set to continue. According to Colliers research, approximately 343,000 square metres of office space is currently under construction in Prague, with a planned delivery time of 2017-2019, and almost all of this new stock, 97%, is being constructed within a 10-minute walk of a metro station. Construction of new offices projects is evident in the proximity of 17 metro stations. The highest volume of office construction is concentrated around Pankrác metro station, with some 48,800 square metres, followed by Jinonice metro station (temporarily closed until August 2017 due to ongoing refurbishment) with 39,800 square metres, and then Radlická metro station with 30,000 square metres. Inner City Prague 5, with offices located in close proximity of Anděl metro station. 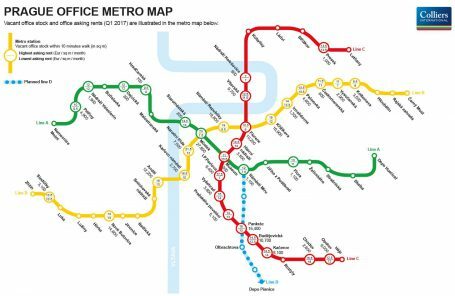 Line B has the greatest amount of office stock around metro stations with 1.071 million square metres, followed by Line C with 713,000 square metres, and Line A with 235,000 square metres. In terms of stations, Pankrác has the greatest amount of total office stock within walking distance at 227,000 square metres with vacant stock of 16,400 square metres; followed by Náměstí Republiky with total stock of 206,600 square metres and vacant stock of 19,800 square metres; and Můstek with total stock of 198,500 square metres and 27,800 square metres of vacant stock. Chodov, with 101,700 square metres of total stock, has the lowest vacancy amount at just 2,600 square metres.